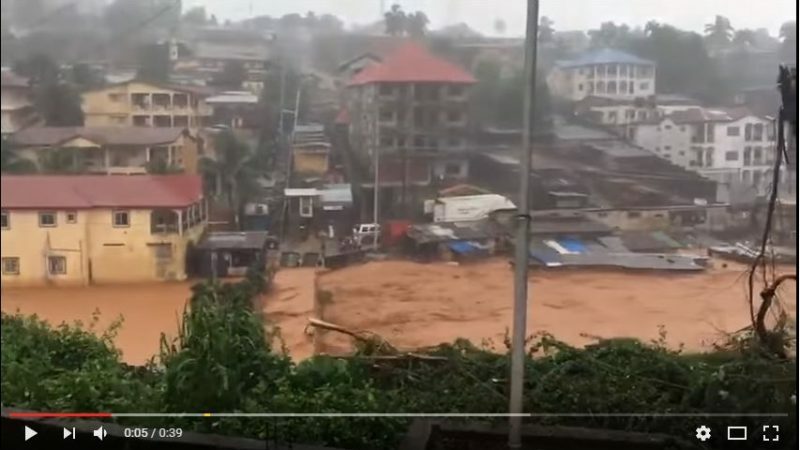 Screen capture of a video of the floods in Freetown, Sierra Leone, from Breaking News YT channel. The recent catastrophe which struck Freetown, capital of Sierra Leone, where torrential rains left hundreds dead and thousands homeless, demonstrated yet again the vulnerability of African cities and their increasingly fragile populations, especially the occupants of shanty towns. The August 15 rains brought in their wake not only flooding but also unprecedented landslides. Predictably it was the poorest who were impacted the hardest. Amid spiralling populations and low rural incomes, African capitals are exploding under demographic pressure. Shanty towns spring up daily and mushroom overnight. The state cannot keep up with the pace of population growth and so the problem expands. Only when large numbers of people look to settle in areas not intended for housing do the authorities intervene and take drastic measures. This is what has happened in Conakry, the capital of Sierra Leone's neighbour, Guinea. Without any regulations, a large group that came from the country's rural interior settled anarchically in the area around a river almost 20 years ago. 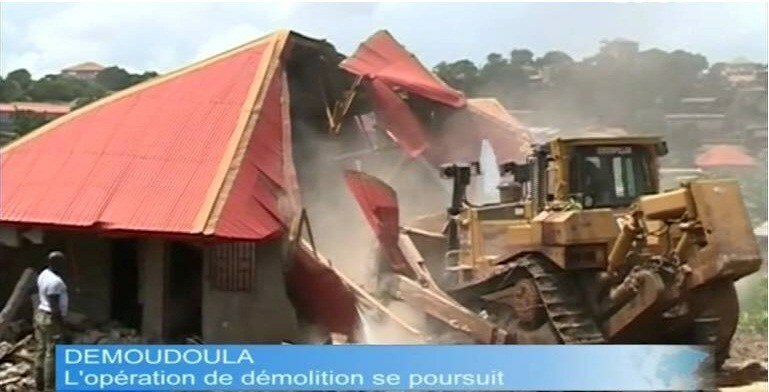 The government recently launched an operation to demolish the district of Démoudoula, created at the turn of the milennium, spurring a sharp debate on social networks. There is a human drama taking place in Demoudoula. For several days now, in this neighbourhood in the Ratoma district of Conakry, bulldozers have been at work on the demolition of occupied houses, putting women and children on the streets, with no idea where to go, or who to look to for help. Their plight comes in July — a month when the heavens open remorselessly in Conakry. But who's going to trouble their heads about that? These houses being destroyed by the State are so many dreams being shattered, so many familiar links broken, so many bodies degraded, so many hearts bruised. Every smashed brick represents months, if not years, of hard labour. A whole life demolished under the haggard gaze of children and the powerless gaze of parents. In Guinea, we live for two things: our families and our homes. For us, when you've destroyed someone's house you will have destroyed their whole life. And no amount of compensation makes up for such a tragedy. But what is the charge against these victims of the July [demolitions]? Illegal occupation of the river Démoudoula (‘Land of the Chimpanzees’, in the Pular language), apparently. And what is their fate? To be abandoned in the street! Is this so as to protect these fugitives from a possible flood, and so preserve their lives and belongings? Hardly, since as the saying goes “prevention is better than cure”. They should have been prevented from settling there in the riverbed earlier. Didn't the corrupt agents of the State sell these poor people their plots in the first place? Besides, when it comes to risks in Conakry there are much worse ones elsewhere: the mining waste which threatens at one and the same time a human and an ecological catastrophe; the dumping of hydrocarbons at Kaloum, right by the Tombo central electricity station, where any explosion (God forbid) could ravage the whole of Kaloum; the various garrisons installed at the heart of the capital (who can forget the deadly explosion of the munitions store at Alpha Yaya camp in the early 2000s? ), etc, etc. Is it to protect the environment? Maybe. But is Démoudoula an isolated case in Conakry? 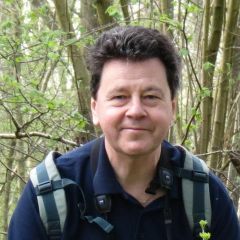 What about the forests of Enta, Dabompa, Démoudoula? What about the many filled-in water channels in Conakry? What about the invasion and destruction of our coastline?Where are we left, with these devastating plans, condemned by civil society activists, for our waterfronts? Is our Guinéan forest indeed “strong”, in a country where the principal source of energy is drawn from charcoal? What are we doing to promote alternative energies? How much does a bottle of gas cost in Guinéa? [Translator's note: Forêt Forte, or Strong Forest, is the name of a timber company based in the country]The chimpanzees of Démoudoula have long since been displaced, hunted and probably eaten. Now human beings are being displaced from here by digger trucks. Let's say it was both to preserve the environment and to protect the river-dwellers and their property. Then this is neither the time nor the means. It ought to be done with appropriate timing (not in the midst of the rainy season), having regard for an adequate warning period and a clear plan for resettlement and compensation. Finally, I think our State is suffering from “demolitionitis”. On the ruins of Kaporo-rails, hatred and delinquency have sprouted. Houses are being destroyed in order to build frustration, bitterness and hatred. Alimou Sow is referring to Kaporo-rails, a Conakry neighbourhood razed to the ground in 1998, leaving more than 120,000 people on to the streets after the destruction of thousands of housing units, mosques and school buildings. This moving intervention by Sow sparked many reactions, some supporting the state's intervention, others asking themselves the same questions as he does, but reaching different solutions. I agree that the timing is very poorly chosen. But they must be removed by the state, which must in return support them, either by compensating them by taking away the fees from who those sold them the land… or else by supporting their action directly against the people who have ceded the land. But go they must. Sény Touré meanwhile condemns a trail of negligence by the state which has hurt the poorest. In particular, he singled out the expropriation of a plot of land at the Ignace Deen Hospital to build a luxury hotel, as well as the sale of another property of over 3 hectares allegedly released by the state for the equivalent of 25 euros, displacing the original occupants. This land, situated in one of the most dynamic zones of the Guinéan capital is being made home to the Résidence 2000 complex. The complex will consist of a hundred or so high-class apartments with a view of the southern harbour front and should attract rents starting from 2,000 euros a month. The project is controversial not only because of the expulsion of the local population, but also for its negative environmental impact. Too many paradoxes in this joint! They smash houses — built on a river bed, granted — but they have encouraged the construction of a hotel in the garden of the Ignace Deen Hospital! An ex-garden for patients converted into a hotel! And the poor inhabitants of Koba who are suffering the effects of Résidence 2000? Who should they complain to? I say it once more: we see the mote in the other's eye, but not the beam in our own. Alimou Sow, I don't know, but I have the impression that this regime is fond of social crises. And one last thing: what kind of contractor turfs people out in the middle of the winter? Makes no sense, but what the hell? What irks me most in this story is this selective demolition. Kiridi Bangoura (a government minister) has his mansion right in the riverbed, but he isn't worried. Is there an agent of the state today who doesn't sleep in a luxurious palace with its feet in the water? Buildings erected with hundreds of cubic metres of earth tipped on all sides to repel the waters to get themselves a dry plot. Just the tempo you need to stir up a real mayonnaise, as all the ingredients are already assembled — and we are risking grievous consequences. The Department of Housing suspended demolitions for humanitarian reasons for the period of June 15-October 15, after frequent protests by citizens and civil society organizations. Nevertheless, as if to pour scorn on the victims, the announcement was published on June 29, only a few weeks after the demolition was scheduled to start on July 13. In an announcement on July 19, 2017, the government promised to compensate citizens whose property deeds are recognized as regular, while prosecuting undocumented occupants.